My life has become research, research, research. The life of the essay, and its various form and shapes: personal essay, narrative essay, memoir. I’ve really dug into the essay, feeling its impacts and looking to see what it’s really capable of. In July, I studied language as a concept, Pinker’s “The Language Instinct”, and other educational theorists presenting theories of second language acquisition, and wrote my heart out about teaching and learning language. But in August, I turned to contemplative essays. At least I thought I was turning to contemplative essays, until I started pouring out more Memoir, thus transforming the shape of the narrative into personal essay. In the meantime, I tried to get the whole style-form thing straight. And in creative nonfiction, does it matter? 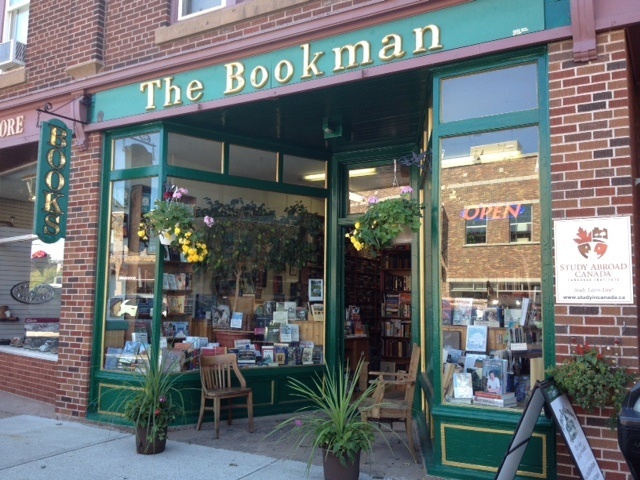 The point is, I’ve been going to The Bookman a lot, one of the few second hand bookstores left in Charlottetown. It doesn’t have a fancy website, where you can fill an online shopping cart, find weekly reviews, follow your friends or leave comments for the owners. It’s all in 3D. It has a door, about twelve highly piled shelves (to the ceiling! ), and a customer service agent (aka the BookMan) who may or may not be able to help you find Micheal Montaigne, or the other thousand or so authors the BookMan may carry. You can find him reading quietly behind the cash register. I went in there for some obscure Thomas Merton books from the 1950s, which the gentleman gladly helped me find by waving me down an aisle, and upon noticing my giant pregnant belly, pulled me up a ladder. My daughter disappeared down the next island towards the kids corner, where a tiny stool sits quietly in the sun, and where lives what is surely the most impressive collection of Berenstein Bears books east of Montreal. As I walk through the Bookman’s dusty aisles, I muse over all the times I came in looking for old, obscure maps or used Lonely Planets. I’ve learned a lot here. I move slowly back towards Philosophy and Religion: the study of Contemplation. I gather books until my arms are full, and make my way down to the cash. Leila is hard to round up, now into a Ramona and Beezus collection on a shelf almost too tall for her. She hates to leave this magical place, where worlds open and close each time she twirls around. The man behind the counter reaches out for my pile of texts. There is a book at the cash, The History of Stilletos that I hope Leila doesn’t notice or that she’ll want. The kind man rings me in and lets Leila pick three free books from a small stack of Little Goldens. He makes conversation, tipping his glasses back up his nose every once in a while. Suddenly, I feel sad for him, disheartened for book sellers everywhere. “How are book sales?” I ask him, hopeful. “Can you compete with Kindle? e-readers? Amazon?” I think i know the answer: technology kills books. I look around at the small store, which there are still a few people in, and engage in the usual PEI small talk, the impact of tourists, etc. Then I get to what I really want to know. “Are things changing for you?” I may be treading on thin ice, here. “Wonderful news!” I say, momentarily stunned and impressed by the miracle of teenagers. I glance down to my daughter. In a month, she will turn seven. The BookMan continued. “On the Road, and all that. Kids are still reading that stuff. They want real books.” We both check out Leila, who is grinning behind her free copy of Cinderella. I breathe deeply, yes. I remember Jack Kerouac and for a moment, those days of my life. Beat poets and the Greek philosophers were a rite of passage – but would they still be for Leila? “Maybe by the time she’s old enough, she’ll open a book and Aristotle will appear in 3D!”I picture Aristotle jumping out of the text – a broken image but nonetheless there, at the podium, like in an old Star Trek episode. I try to explain it, but get lost talking too fast. I think about the interactive iPad books with their sparkles and their music and I consider the possibilities of books bringing with them projections and interactions- my mind races: an old Dylan show, a Ginsberg reading, even a Steve Jobs commencement address! “I have no idea what you just said there,” the man behind the counter says once I’ve drifted away, “I just sell books.” I’m immediately apologetic, as I realize that I could be twenty years younger than him. “I love books, too.” I said. “Thanks for the freebies.” You don’t get those online, I think. Enjoyed your essay on the Bookman! Yes! Books! Forever…but Lei turning SEVEN???? Whaaaaat?